I’m hoping you can help me with some information regarding carpet beetle infestation and the itching it can cause. I live in Michigan, and I just recently found a bunch of carpet beetles all over my home, on every level, including the basement. We vacuumed, sprayed, bombed, sprayed, vacuumed again, and had Orkin come out twice now, and vacuumed some more. I read an article (but only found one) that said that the little tiny hairs on carpet beetles can cause severe itching. It seems me and my two dogs have the hardest time with this, but my husband and daughter don’t. Apparently, if you wear socks it creates an electrical charge that attracts the hairs to you, and vacuuming does too. My question is, how do we get rid of the microscopic hairs that are all over the house, and how long does it take to go away? Have you heard of this before? I’m not sure if this is common or not, and I’m guessing I’m allergic to them somehow, but I’m going crazy with itching…LOL. Please, any information you can give me would be greatly appreciated. I thank you for your article which was very informative, and I thank you for your time. Have a wonderful day! p.s. The itching has calmed down since we began treatment, but not completely:) I’ve seen a dermatologist for steroid shots and prescription strength lotion. In fact what you are experiencing is not that unusual. More commonly known as carpet beetle dermatitis, the symptoms described match what you are experiencing but the exact cause is not clear. It could be something about the beetle itself as many insects can cause allergery. But in all likelihood, it has more to do with the carpet or a by product of an active insect (like the carpet beetles) living in the carpet. Common culprits include carpet beetles, bedbugs, fleas, roaches and carpet mites. In my experience, the quickest and most direct way to resolve these problems is to remove the carpeting. In general, carpets do nothing but hold and maintain all kinds of nasty things. Insect feces, dust and all kind of allergens to name only a few so it’s little wonder their ever tolerated in the home in the first place. That being said, I know many people like having carpets so trying to cope with the problem is more likely what you’ll be doing and with that in mind, here are some suggestions. First, make sure you get a good vaccuum. If the one you’re currently using isn’t cutting it, upgrade. This could be a less costly option compared to removing the carpet and could resolve the problem quickly. Two, don’t stop treating. Carpet beetles, as well as many other insects that can live in carpets, will many times take awhile to “run their course”. This means more will replace the ones you kill so it’s important to keep treating for at least 9-12 months to resolve most infestations. Three, don’t ignore area rugs, especially the bottom side of these, as well as furniture and drapery. All fabric can harbor carpet beetles so make sure you get them all treated throughout the home. Four, be sure treatments include a long term growth inhibitor. We prefer the GENTROL or NYLAR. Both do a good job of stopping the cycle. A good adulticide to use would be PERMETHRIN 10. Alternatively, the ONCE A YEAR FLEA GRANULES seem to work on this pest really well too. Though designed for fleas, we’ve learned the granules dry out the “carpet environment” where the larva of this pest (and so many others) like to live making it impossible for them to exist. It also seems to help “cleaning” the carpet by absorbing allergens and other contaminates. Lastly, don’t forget to take care of the dog too. Bath them with a good shampoo like MELALUCA SHAMPOO. This will help reduce the itching. OXY MED ITCH RELIEF is another good topical treatment for their skin and should remove any hotspots they’re fighting. How do I treat carpet beetle bites? We have two options depending on how your bite “feels”. 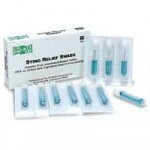 If the bite is itchy like a mosquito or flea bite, go with STING SWABS. They offer immediate relief from the itch and help promote healing. 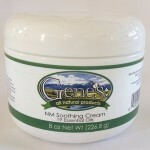 If the bite is more of a “sore”, go with GENE’S SOOTHING CREAM. This is more of an ointment and will provide relief from all other kinds of discomfort people can experience from carpet beetle bites.